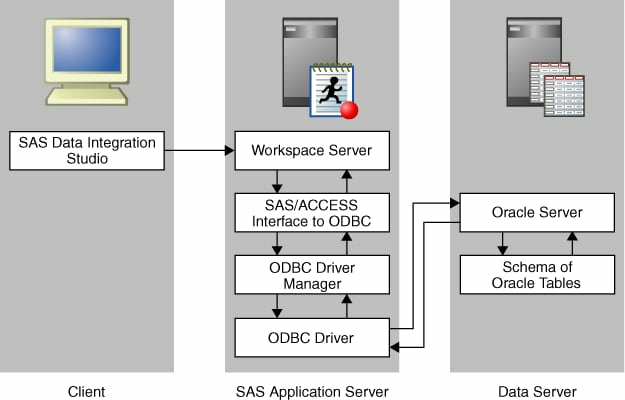 The following figure provides a logical view of using Oracle as a data source and connecting to the database with a SAS/ACCESS ODBC interface. Define an ODBC data source. installation of SAS/ACCESS Interface to ODBC. For configuration information, go to the Install Center at http://support.sas.com/documentation/installcenter/93 and use the operating system and SAS version to locate the appropriate SAS Foundation Configuration Guide. installation of a supported Oracle Database Client if your ODBC driver requires a client. Refer to the ODBC driver vendor's documentation to determine whether an Oracle client is required. validation that the Oracle client can communicate with the Oracle server. (UNIX only) configuration of SAS/ACCESS environmental variables. For information about setting environmental variables when you use SAS/ACCESS to connect to data on UNIX systems, see Setting UNIX Environment Variables for SAS/ACCESS. Open the Windows Control Panel. Then, double-click Administrative Tools. Double-click Data Sources (ODBC) to access the ODBC Data Source Administrator dialog box. Click Add to access the Create New Data Source dialog box. Click the Oracle driver listed in the window (for example, Oracle in OraClient10g_home1). Click Finish to access the Oracle ODBC Driver Configuration dialog box. Note: System data sources and user data sources store information about how to connect to the indicated data provider. A system data source is visible to all users with access to the system, including Windows services. A user data source is visible only to a particular user, and it can be used on the current machine only. For this example, we are creating a system data source. Click OK to save the configuration settings and return to the ODBC Data Source Administrator dialog box. Then, click OK to save the data source. Open the SAS Management Console application. Right-click Server Manager and select the New Server option to access the New Server wizard. Select ODBC Server from the Database Servers list. Click Next. Enter an appropriate server name in the Name field (for example, ODBC Server). You can supply an optional description. One server is required for each DSN. Click Next. ODBCAuth (You might need to create a new authentication domain. For more information, see How to Store Passwords for a Third-Party Server in SAS Intelligence Platform: Security Administration Guide.) Click New to access the New Authentication Domain dialog box. Then enter the appropriate value in the Name field and click OK to save the setting. Examine the final page of the wizard to ensure that the proper values have been entered. Click Finish to save the wizard settings. In SAS Management Console, expand Data Library Manager. Right-click Libraries and select the New Library option to access the New Library wizard. Select ODBC Library from the Database Data list. Click Next. Enter an appropriate library name in the Name field (for example, ODBC Library). Note that you can supply an optional description if you want. Click Next. Select a SAS server from the list and use the right arrow to assign the SAS server. This step makes the library available to the server and makes the library visible to users of the server. Click Next. You can also click Advanced Options to perform tasks such as pre-assignment and optimization. Click Next to access the next page of the wizard. See your database administrator for the correct value. Use the default value of Connection: server_name. Use the default value of (None). Examine the final page of the wizard to ensure that the proper values have been entered. Click Finish to save the library settings. At this point, register tables as explained in Registering and Verifying Tables.